There's something extra homey about making your own chicken stock. Not only is it less expensive than buying the boxed stuff at the supermarket, it is WAY healthier for you, too. And OH how my home smells soooo yummy while the stock is simmering on my stove!! I just love knowing that I am giving my family something that tastes so good. 1) Rub 5 chicken breasts (with skin and bones) with extra virgin olive oil and sprinkle liberally with salt and pepper. Roast chicken breasts in a 400 degree oven for 45-55 minutes until it is golden brown. Remove from oven and let cool. Once cool, separate the meat from bones and store the meat for later use. 2) Place chicken bones and fat in an 8 qt stock pot. Roughly chop 2 onions, 4 ribs celery and 3 carrots and place in stock pot along with 2 bulbs of garlic (cut in half) and 4 bay leaves, 2 tsp dried thyme, 1 tsp rosemary and a big handful of peppercorns (yes, put them in whole). And, this may sound like a strange ingredient, but also add 2-3 T of apple cider vinegar. Cover everything with water to the very rim of the pot. Cover with lid. 3) Bring stock pot to boil and then uncover and turn down to a simmer. Let this simmer away on the stove for about 6 hours (Yes, you need to be home all day to do this, but BOY is it worth it!!!). The water level will go down 2-3 inches and you will be left with a dark, flavorful broth!!! 4) Once it's done simmering, turn the stove off and let it sit for about 30 minutes to cool slightly. Using a colander, drain the stock into a very large bowl (I use another 8 qt stock pot). The colander will catch all the vegetables, spices and bones and the stock will drain into the large bowl. Discard the lefover vegetables and such and let the stock cool for about an hour more. 5) Once it's cooled a little more, cover the bowl and put it in the refrigerator. I usually let it sit in the refrigerator overnight. The next morning, the fat has risen to the top of the stock and solidified and I can easily skim it off and discard it. 6) Ladel the chicken stock into your containers to freeze the stock (and be sure and leave some headroom to freeze) for later use or use right away in a yummy recipe for your family!!! 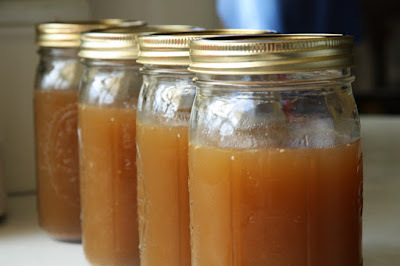 I have always wanted to make my own stock, but I still haven't because I don't have enough room in my freezer. Maybe this post will motivate me to get started! Because you have to be home all day you could also bake some bread to go with the soup! Yum! Homemade really does taste so much better! I like your method a lot....sounds like a fun project for a day at home! Your stock looks gorgeous. As I type this, the smell of MY stock is wafting upstairs from the kitchen. It is liquid gold! !